However, if you’re contemplating making the ultimate step in sharing — adding someone to the deed on your home — it’s a good idea to consider the consequences. It’s important to understand that when you add someone to your deed, you are entitling them to the same “bundle of rights” — control, enjoyment, possession, exclusion and disposition — that you have as a property owner. Before adding a loved one to your deed, it’s important that you speak to an estate attorney and your mortgage lender to ensure you understand your rights, and to determine if this is the right move for you. 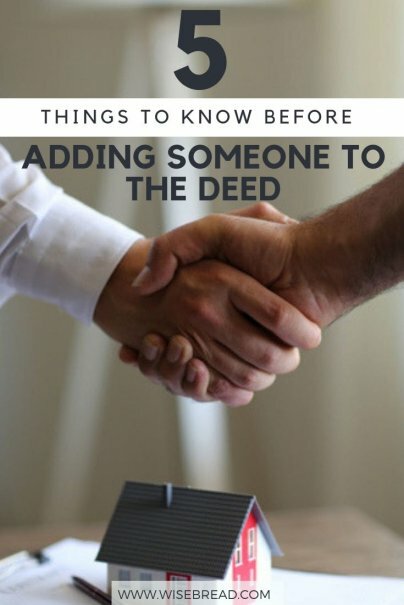 Here are five things you should consider before adding someone to your deed. When you add someone to the deed, all or a portion of your ownership is transferred to that person. Once it’s done, you can’t take it back unless the person you’ve added provides consent to be removed from the deed. He or she can take out a loan on the property, tear it down, or even sell their share of the property. And in some cases, there’s nothing you can do about it. Even if you transfer only a portion of your interest in the property, that person will have full control of their portion and may be able to force a sale of the property. If you want to refinance or sell your home, you must get permission from the individual you’ve added. This can lead to time consuming and costly legal battles that can tie up the property for years. Make sure you fully understand the implications and consequences before you sign on the dotted line. The law doesn’t forbid adding people to a deed on a home with an outstanding mortgage. Mortgage lenders are familiar and frequently work with deed changes and transfers. Most lenders incorporate a loan “due-on-sale clause,” which gives them the ability to call in the loan if the deed is transferred or if the home is sold. When you “deed” your home to someone, you’ve effectively transferred part ownership, which could activate the “due-on-sale” clause. Let’s say you decide to add your brother to the deed. If he fails to pay taxes and incurs a tax lien, has problems with creditors, or goes through a nasty divorce, the IRS, his creditors, or his ex-spouse can lay claim to your home, or at least to his portion. In that situation, the entity owed can place a lien on your property and attempt to force a sale to collect the debt or tie up the property and prevent you from selling. Adding someone to the deed of your home can also generate income tax liabilities when the residence is sold in the future. When you add someone to your deed, the IRS sees it as a gift. That person becomes subject to IRS regulations concerning gifts. As of 2018, the IRS allowable gift limit is $15,000 annually, per person. Gifts that exceed this amount are subject to the gift tax. There are so many hidden risks and pitfalls to adding someone to the deed. Remember, you become a joint owner rather than the exclusive owner. This change can impact your eligibility to sell or refinance. And for older homeowners near retirement age, transferring assets can adversely affect Medicaid eligibility. Another thing to consider is that adding someone to the deed does not make them responsible for the debt. Unless the original loan agreement is modified, you are still solely responsible for repayment and the other person has ownership rights.